...and here it is, out in the snow. Measures about 22" square. Close-up, you can just make out that I quilted in the black background with radiating lines, 24 of them, I think. And a free-handed 7 petal flower in the center. I'm debating sewing a great glass button to the center.... it's blues and purples and just lovely. 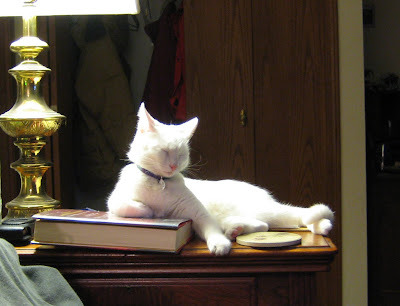 Last night, Nosey Parker took a snooze on her daddy's book, under a nice warm light bulb. That stone coaster isn't long for her world, though. Twitch, kick, CRASH. 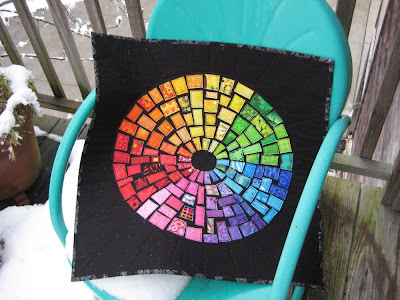 Just LOVE your color wheel! And bless you for caring for your furry family, through it all!! Hope everyone's feeling better soon. Aw, Sooz, you're good parents to those furry kids! Lovin' your ticker rainbow!! Clever clogs. Get some sleep!! Wow, I love your ticker tape color wheel! So sorry to hear about your animal troubles, but on the bright side I am glad to hear your bladder is fine. Well, at least you're not peeing on the couch YET! Hurray for that! I've got an "oldie" too so I know what you're going through! Mine can hardly make it up the back steps to come back into the house. Sad! LOve your new quiltie! Gorgeous! We have two little tiny doggies that are both getting quite old. We can't both go away at the same time for very long either. The Yorkie can't usually make it through the night either. Bless you. I love your little color quilt. Great job! 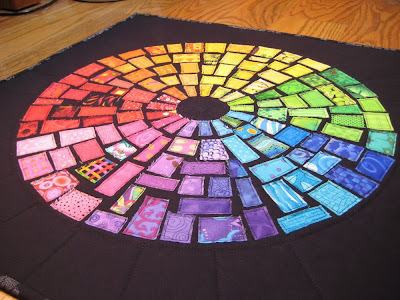 Your color wheel is absolutely gorgeous! I love it. I hope you and the animals are doing better soon. I'm sorry the doggies are getting sick with the flu. Hopefully they'll be okay before long. Your older dog is so lucky that he is loved and cared for so well. As we age it's not always pretty, but someone like you makes it better. It's all about love. LoVe the color wheel!! SUCH a great idea. How can we not do anything and everything for our pets, right? I once had major surgery done for an African Pygmy Hedgehog. 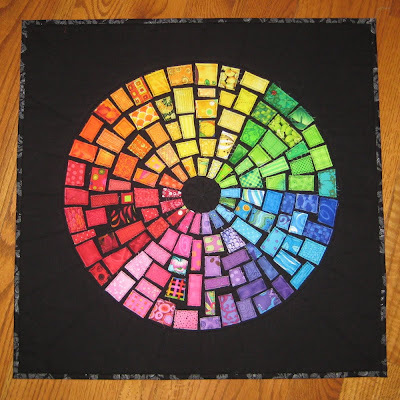 I love this bright ticker tape quilt! I love this. Both ticker tapes and color wheels are on my to do list. This would be a great way to cross two things off at the same time! A while back, I saw Harrison Ford on Jay Leno. He was talking about getting old and having a girlfriend with a baby. Anyway, he had to stop at a convenience store to buy diapers. He asked the clerk where the diapers were. The clerk directed him to the adult diaper section. LOL Everybody had a good laugh over that. Wow, I never realized that pets can get the flu too. Hope it's all over soon!! !